So, you know you want to put on a play. Perhaps there’s a show you’ve been burning to produce. I know I have a list: — anyone who wants a director for Life is a Dream, King Charles III, Cymbeline, The Music Man, or Our Betters, let me know! Why do we need to hear this story, told in this context with these words? And, especially in an age in which many stories can be told on television and film in a very compelling fashion, “Why do we need to see this story told as a play?” These are questions I continually ask myself and my collaborators throughout our rehearsal process. They are the questions that drive me to create theatre – this transient experience, created in a singular moment in time. Sometimes, the play itself seems to answer these questions immediately. Sometimes, it’s more of a challenge. Producers selecting plays may also use this criteria to drive their lists of dream shows – and yet sometimes logistical factors, a desire to put together a season of plays in dialogue with one another, or the desire to find the perfect play for an ensemble of artists you love set producers on a more directed, play-specific hunt. And of course, budget is always a limiting factor. Producers often organize seasons of plays based on themes, burning questions, time periods or even as a profile of a single playwright. If you know there’s a playwright you like, it might be worth checking out his or her lesser-known works. If you’re organizing a season thematically, you might also want to check out the ‘search by tag’ feature in StageAgent’s show guide search. Each play and musical is tagged according to its theme, so if you want to find plays about love or plays about war or plays about longing, a good place to start is by searching by that tag. If you’re doing plays in repertory with one another, that opens another entire realm of considerations. How will you double the casting for the two pieces? Is there a way to put different plays in dialogue with one another? I’ve been dying to do Much Ado About Nothing and Othello in rep for quite a while. A suspected (and false) adultery plot lies at the heart of both plays, and producing them in rep would provide an opportunity to explore these different worlds in conversation with one another. Creating fantasy rep seasons is a hobby of mine – perhaps you can make the fantasies come to life! Particular artists can also inspire play selection. If you’re looking for a great role for your favorite leading lady, for example, it might be helpful to view her resume on StageAgent for roles she’s recently knocked out of the park. StageAgent lets you read analyses for those characters and see what other characters are similar. For example, if you recently produced Taming of the Shrew with a phenomenally feisty Kate, you might consider producing Love’s Labour’s Lost and casting this actress in the role of Rosaline. Want a great ensemble show? Search on StageAgent with the tag “Ensemble Cast” and shows like Rent, Next to Normal, and Clybourne Park will come up. There’s also an opportunity to create a more ensemble feeling to casting by doubling roles. 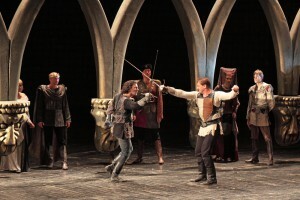 For example, if you reduce the number of actors playing the roles in Twelfth Night from 25 or so (including extra attendants) to twelve, the balance of the cast shifts significantly, giving each member of the ensemble a significant amount of stage time and text, and an critical role to play in the storytelling. And then there are, of course, budgetary constraints. The ever-present reality dictating many of the choices – including the artistic choices – made in the theatre. Myriad factors go through the producer’s mind when examining his or her budget. Here are a few that are generally at play: Cast size. Small casts are in. Why? It creates an intimate feel and a tight ensemble – but also you have to pay fewer actors, create fewer costumes, etc. Again, you can hunt for the perfect small cast piece using the StageAgent show guide search, which has a filter for cast size. Here are five musicals with small casts that you might want to consider producing. Rights cost. 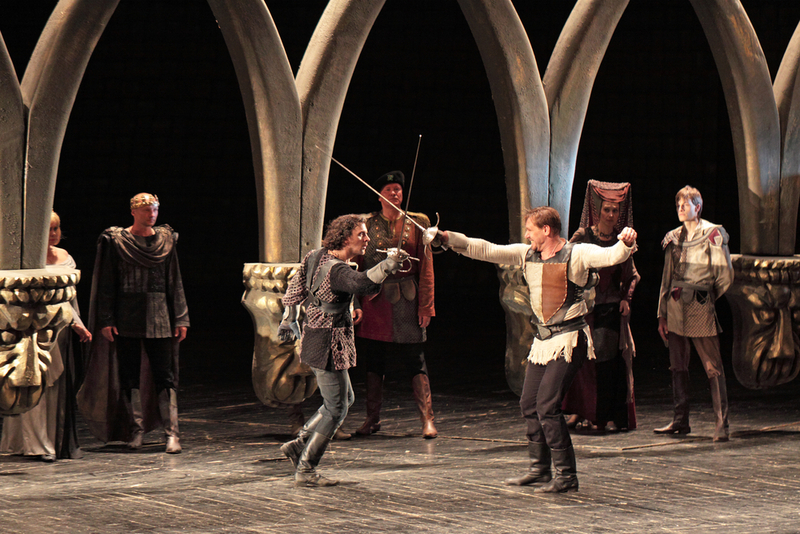 Rights for plays still under copyright must be procured in order to produce. You can browse shows on different licensors websites, directly, such as Samuel French, MTI, and Dramatists Play Service. Some plays, however, were written early enough that they are now in the public domain (for example, all of Shakespeare, Noel Coward and Moliere are now in the public domain.) Another way is to collaborate with a new playwright, who might charge you less to produce his or her play. Directly contacting talented but currently not-very-well-known playwrights Oren Stevens (http://www.oren-stevens.com), MJ Kaufman (http://mjkaufman.com), Marjuan Canady (http://www.marjuancanady.com), and Gary Jaffe (http://www.garyjaffe.net) is a start. Elaborate design requirements. A play with multiple settings that requires a flying chandelier (ahem, Phantom) or a helicopter flying in (ahem, Miss Saigon) can be MUCH more expensive to produce – though, again, these elements can be a huge audience draw. Some plays, however, have unit sets or require almost no setting at all. For example, Our Town is often staged with nothing more than a ladder and a handful of simple tables and chairs and The Fantasticks may not even need that. This is another opportunity, however, for directorial and design ingenuity to come into play. David Cromer’s brilliant production of Our Town required a fully equipped and working kitchen, complete with a stove to actually fry real bacon, and he made a very compelling case for this costly addition to the production’s design (a moment involving this was one of the most moving I have ever spent in the theatre.) On the other end of the spectrum, a play that traditionally has rather elaborate sets might be incredibly compelling when paired down by a skilled collaboration between a director and a designer. I also have a select list of older shows I’d like to review that haven’t been revived in New York lately (or ever). If you’re doing The Beauty Part, The Entertainer, Hotel Paradiso, The Iceman Cometh, Loot, Man and Superman, No Time for Comedy, Rhinoceros, The Skin of Our Teeth, The Visit, or just about anything by Jean Anouilh, Bertolt Brecht, T.S. Eliot, Horton Foote, William Inge, or Terence Rattigan, kindly drop me a line. You can also browse through social media sites like Quora to get ideas for shows to produce. Of course, these are only places to start. The possibilities are infinite. Let the dreaming and scheming and playing begin! Thanks for your website and blogs. I just discovered you a month ago while doing a search for monologues for an audition. I’m new to community acting. I retired from the “stage” of corporate public speaking 3 years ago, and get to finally pursue my lifelong dream of acting. I’m having a blast! Welcome to the wild and wonderful world of theatre Bob. And thrilled to have you as part of the StageAgent community! Am seeking criteria to help guide a significant Theatre group become more relevant, edgy, building a buzz in a major Pacific NW city. Your list of considerations is a good start. How about community connection, community challenge, inspiring change, and reconnecting people to each other across race, gender/preferences, socio-economic, age, political differences? Can these be measured or used to establish new criteria?